In contrast to the usual case when a website needs to be up and running to attract followers, celebrities have a huge fan base which is already established and their websites are seen more as tools through which they connect with their audience. This is one of the reasons why celebrities pay so much attention to their personal online space. In a lot of occasions, celebrities rely on their fans to grow their career and connect with their loyal readers and supporters. What is more their websites carry the distinctive identity of their superstar owners? And very often the unique characteristics and traits of the celebrity are stamped on their websites. 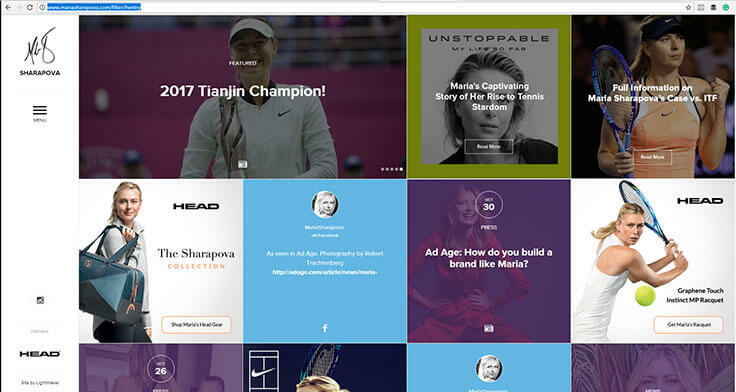 You will be truly amazed by the complexity and the features these WordPress Celebrity Websites have and what is more important, you can create your own brand or dream website with WP too. Get a Fully featured WordPress Hosting account with 90% OFF the regular price! Considering the need of being different and distinctive, it is not surprising why so many celebrities choose WordPress as a CMS on which to build their sites. This is just one more proof of the great world of possibilities that WordPress offers. Do you want to start your own online presence? 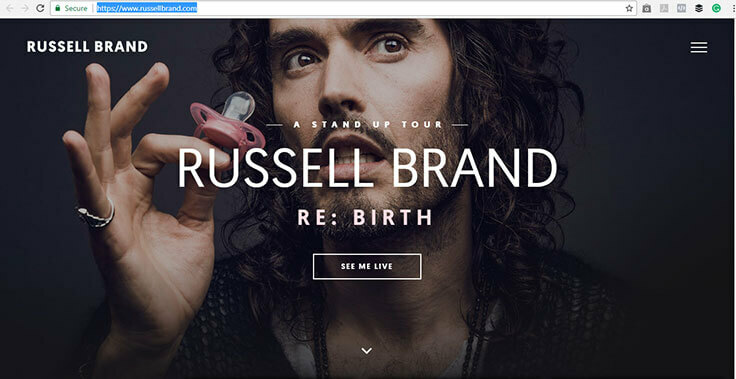 As one of the most eccentric celebrities in the world right now, Russel Brand’s website has similar look and feel. Russel started his career as a standup comedian but soon moved on to become an actor, MTV Presenter, writer, and activist. The famous comedian’s site that provides access to his blog, podcast, fansite, tour dates, and multiple social media accounts is also on the WordPress showcase website. With all-time album sales of over $11 million and all-time singles sales of $81 million, Katy Perry is the highest paid performer of 2015. Being one of the most popular celebrities on Twitter, Katy Perry’s website also has one of the most advanced WordPress designs on our list. When you land on the website you can see all the available options and categories in the navigation menu at the top of the page. However, only if you scroll down you can actually experience the kind of masterpiece that this site actually is. Want to make your website with WordPress? Start now with 90% OFF! 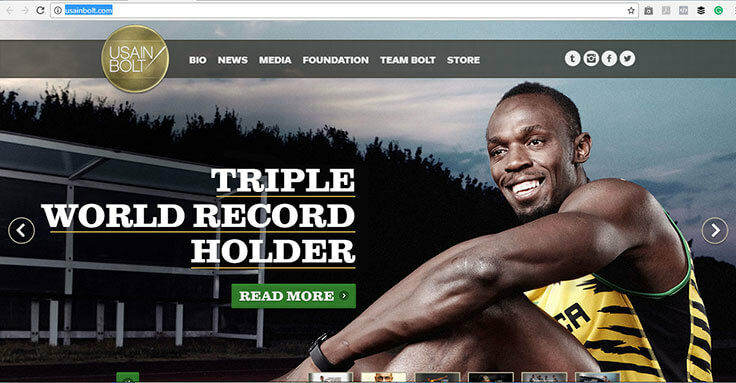 The fastest man on earth has a website that is running on WordPress. Usain is an eight-time Olympic Gold medalist, with a record leaving no doubt that he is the greatest sprinter of all time, holding the record for both 100 and 200 meters simultaneously. But what is more, being the fastest runner in the world offers a lot of opportunities, and they all can be seen on Usain Bolt’s website. Once you visit his website you will experience the great navigation features, as well as the high-quality images within. The incorporated WordPress image-slider will let you see the different images of the super athlete. This is another exceptional showcase website that is worth every second you spend on it. Jay- Z is American rapper, a businessman and one of the best-selling musicians of all time. He is also one of the most financially successful hip hop artists and entrepreneurs in America with a net worth of over USD $150 million. Jay- Z has sold over 30 million copies of his albums in the United States only and has received the incredible 10 Grammy Awards for his work in music. 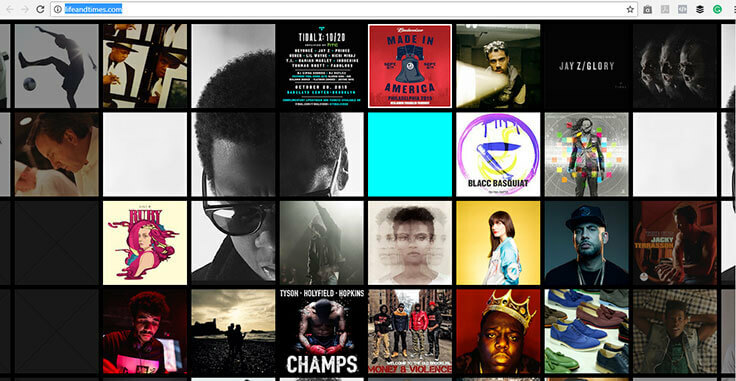 The official website of the King of the hip-hop is built on WordPress. Jay- Z has a massive collection of content on this site and it’s mind-blowing how this content is all laid out through WordPress. Each of the boxes that you see on his page above is actually a different content article. 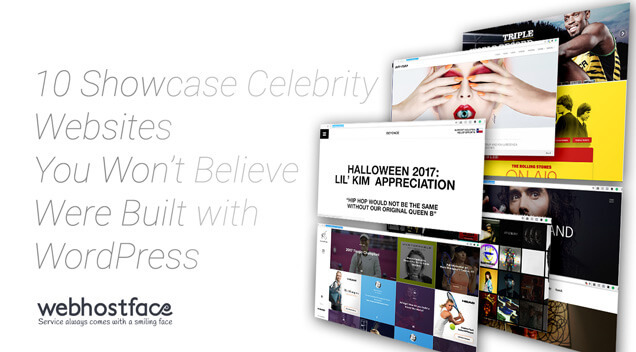 Being of the biggest artists in the entertainment industry, it’s not surprising that his website is also part of the WordPress Showcase Celebrity sites. Make sure you experience this masterpiece website in action. Maria Sharapova is one of the most popular female tennis players in the world and a winner of 5 Grand Slam titles. Thanks to the modern off-canvas menu, her website design looks really professional and clean. It serves more than 4 million fans and allows access to related news and upcoming events, photos and online store. Maria is also a goodwill ambassador for the United Nations Development Program and her involvement in development activities are also highlighted on the website. Start your Brand and Become Popular with WordPress Hosting with 90% OFF! 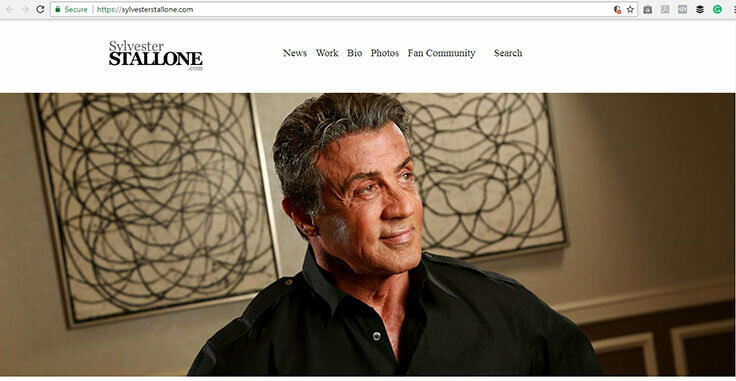 Sylvester Stallone’s website is a perfect example of how minimal and clean design on WordPress should look like. As an actor Stallone uses his site as a hub for his fans to learn more about his acting work, appearances, and artwork. Do you know that Stallone is also a writer, fitness expert and a painter?! If the celebrity wasn’t a world famous actor, you have thought that this is a site of a lawyer or another expert service provider. The official site of the star from Rocky and Rambo is a true showcase of elegance and professionalism. Now you are probably tempted to look for “Stallone” in the WordPress repository. The Rolling Stones is one of the most popular and highest selling bands of all time. Ever since 1962 when the band rocked London, Rolling Stone created a name to stay in the music history. If you visit their rock and roll WordPress driven site you will notice it has captured the unique style of the band. Regardless if you are young or old, the easy to use navigation on the top of the screen and the main page will make your experience a little enjoyment. 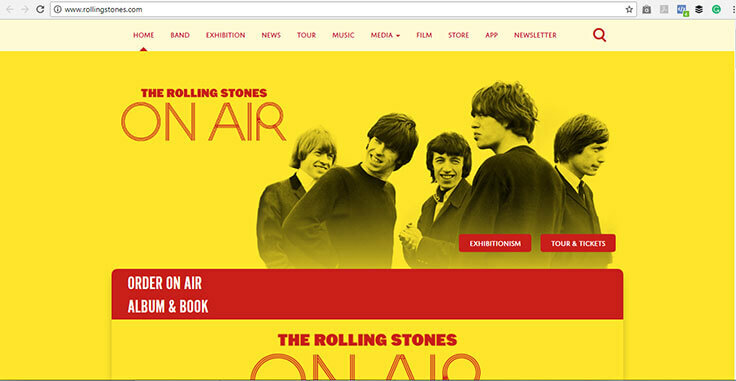 The complete discography of the Stones is entirely managed within WordPress and fully integrated with iTunes. Not surprising at all that their page is described by Gizmodo as the Greatest 404 Error of All Time. The official website of the Grammy award-winning singer and actress Beyoncé is also build with WordPress. 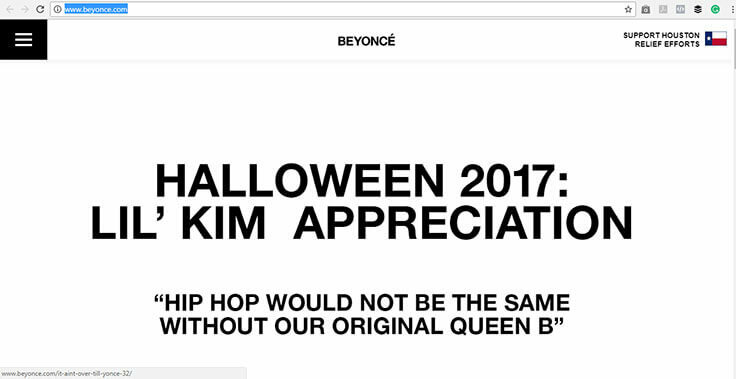 If you visit the site today you will see on the top of the homepage a tribute to the hip-hop artist Lil’ Kim. Further than that, as you scroll down you will notice the interesting layout that involves a full-length pictures. If you want to navigate further in the website you will need to click on the pull out menu on the top left corner. 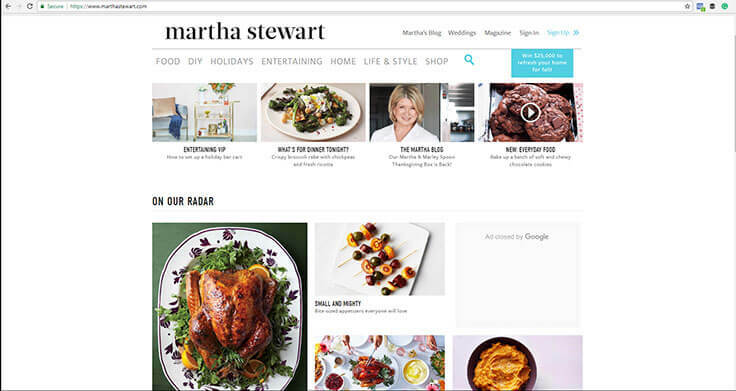 Martha Stewart’s WordPress site elegant look and feel is absolutely what we would expect by one of the favorite moms and chefs in the American television. Since her site covers an extensive variety of topics, ranging from recipes to travel and from gardening to entertainment, it is super easy to spend a great deal of time on it. We guarantee you that the beautiful images and custom fonts that are used throughout the website will make your visit a real pleasure. Get your hobby kitchen and life hacks website with WordPress with 90 OFF NOW! The official website of the Australian singer, songwriter and an actress is powered by WordPress. This artistic site is made to suit well “The Goddess of Pop”, as Kylie is often referred to. 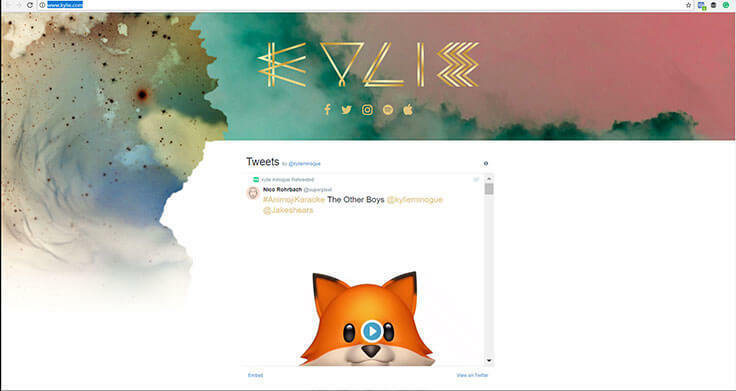 Simply branded as “Kylie” in the header menu, the site is pretty straight-forward, having all important social media sharing options, including links to Spotify and AppleMusic. The Twitter account of the celebrity is fully integrated on the main page for a live update of all her fans. As you can see after going through our list of celebrities’ showcase websites, WordPress is simply amazing. It doesn’t only offer a free content management solution but a whole universe of customization and possibilities. Thank you very much for the very good article sharing with us. Well written blog post.Thank you for sharing!